I came across this photo in my archive from quite a few years ago. I was taking one of those awful online C++ tests as an initial pre-interview screener. I took a photo of this question as an example of the standard of questions this particular company was asking. When you’ve gone through a series of timed questions like this, you start to second-guess the person who wrote it. Clearly the variable “o” is a stack-based variable, a pointer, so will be destroyed at the end of its scope. 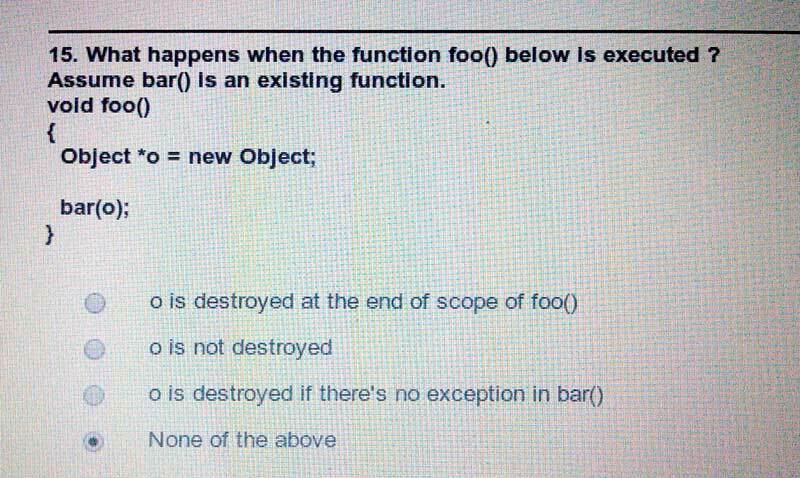 So technically the answer is “a”. But I have a feeling the person that wrote this dubious question actually means to ask about what o points to, especially as it’s a memory leak (unless the mysterious bar() function deletes what o points to). I remember being in a quandary about this one… do you answer entirely correctly? Or do you try to answer the question you think is being asked? Obviously in a face-to-face or telephone interview one could discuss this. I’ve always preferred, when being the interviewER, to sit down with someone in a real-world situation, give them access to Stack Overflow and Google (which, as we all know, are essential tools of the trade these days), and ask them to explain their thought processes. If you’re turning down potential candidates on the strength of questions like the above, I’d argue you’re doing it wrong. Note: this is an introduction to / overview of Boost MultiIndex. It is not intended to be in-depth. So. Containers. In the words of luminaries in the C++ field such as Chandler Caruth, Scott Meyers and plenty of others, reach first for std::vector! 99% of the time this container, out of all the choices you have in the STL, is the right choice. The next most obvious is std::map if you need to “index” access to data: for example if you store 1,000,000 phone numbers and you want to quickly find one given a name, a std:map will give you “indexed” access – you look up your data in O(log n) time (or potentially quicker if you’re using a std::unordered_map) as opposed to O(n) time for an unsorted std::vector. (Obviously these are theoretical complexities – see a previous post which advocates actual benchmarking, as processor cache and branch prediction can have a huge effect). I saw a question online recently which basically asked whether big-O notation always holds true in practice. For example, in theory, searching through a vector for an item should be O(n) whereas searching a map should be O(log n). Right? Let’s imagine we create a vector with 100,000 random integers in it. We then sort the vector, and run two different searches on it. The first search starts at the beginning, compares the element against the value we’re searching for, and simply keeps incrementing until we find it. A naive search you might say. Without resorting to std:: algorithms, how might you improve it? A worthy idea might be a recursive binary, or bisection, search. We might, for example, make 15 bisections to find a value in the upper quadrant of our range, compared to, say 75,000 comparisons in the brute force approach. That’s fairly safe to say that the binary search is going to be much faster, right? Are you surprised to see that the binary search took (very) slightly longer than the brute force approach? Welcome to the world of modern processors. What’s going on there is a healthy dose of branch prediction and plenty of valid processor cache hits which actually makes the brute force approach viable. I guess the moral of this story is, as always, don’t optimise prematurely – because you might actually be making things worse! Always profile your hot spots and work empirically rather than on what you think you know about algorithm efficiency. << " random numbers generated, inserted, and sorted"
C++11 gives us two useful indispensable smart pointers, std::unique_ptr and std::shared_ptr. So much has been written about these that there’s no point me re-hashing anything other than to re-iterate that if you are using “naked” owning pointers in your code these days, you are simply doing it wrong. I wanted to mention briefly the use of custom deleters with smart pointers. If you haven’t looked at this aspect of smart pointers before, it basically gives us a way to specify what should happen when the smart pointer goes out of scope. // hence usage of try/finally instead of 'using'. Running this on Windows it behaves as one would expect. Run one instance you get “Doing stuff… press a key” output, and, if you try to run a second instance in another DOS box you get “Application is already running”. On Linux though it’s a different story – each instance runs as if it’s the only copy on the machine. Doing some digging turns up this note in Mono’s release docs – you can see that shared handles are now turned off by default – you can turn them on by setting the environment variable MONO_ENABLE_SHM, but for the application I’m working on I think I’ll simply avoid mutexes and use something else to ensure one instance – a lock file in the application’s data directory will be simple, and work cross-platform. Here’s a small program… what do you think the output will be?